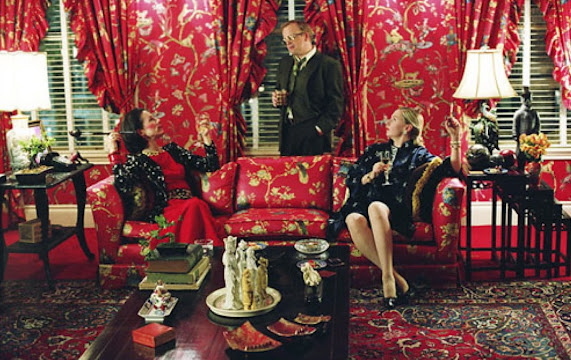 Diana Vreeland and her living room, photographed in 1985 [left], inspired the artist Jeremiah Goodman to paint the 'Diana Vreeland, Garden in Hell sitting Room' [right]. Below, a scene that takes place in this room in the movie 'Infamous' from 2006, a story about Truman Capote. Diana Vreeland (1903-1989) was a noted columnist and editor in the field of fashion. As the fashion editor of Harper's Bazaar, Vreeland commanded and reshaped the content of fashion journalism. Later, she became the editor-in-chief of Vogue and curator at the Metropolitan Museum of Art. Several years before she passed away, she wrote her autobiography, D.V. Avedon said at the time of her death: 'She was and remains the only genius fashion editor'. Jeremiah Goodman was born in 1922 in upstate New York and currently lives and paints in Manhattan. Goodman has painted illustrations of interior spaces for nearly every design magazine from the 1950s through the present. His moody gouache paintings “interpreted” the homes of international luminaries and spaces created by global design leaders: Bruce Weber, Edward Albee, Yves Saint Laurent, Mario Buatta, Diana Vreeland, the Duchess of Windsor, Greta Garbo and Cecil Beaton.